Tickets are on general sale for our school production Into The Woods. 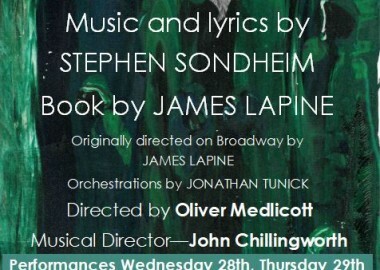 Performances are on Wednesday 28th, Thursday 29th and Friday 30th November. The curtain goes up at 7pm. Sondheim’s popular musical features the humorous and touching collision of a number of well-known fairy tales, as Cinderella, Little Red Riding Hood, Jack (of beanstalk fame), Rapunzel and a host of other characters pursue their wishes, and in doing so discover that actions bring unexpected consequences, and that when wishes come true, the result is not necessarily “happy ever after”. The Tony Award-winning book (by James Lapine) and score are both enchanting and touching. This exciting and challenging musical will combine the talents of the school’s strongest actors, musicians and designers. The Design and Technology Department is heavily involved in this year’s production, creating an immersive set, and the band features the school’s most experienced instrumentalists. 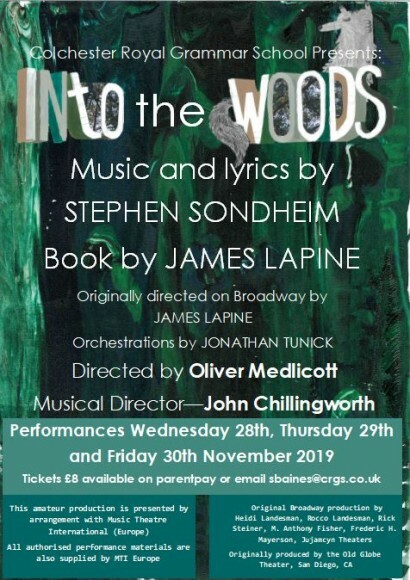 Parents and staff can book their seats by logging in to ParentPay (www.parentpay.com) and looking for the item called ‘Into The Woods’ for whichever day they want to book. For all external enquiries, please contact Miss Baines (sbaines@crgs.co.uk) who will be able to reserve seats for you (if they are available) and give you an online link through which you can purchase the tickets. The cost of a ticket is £8. You should receive receipt information on screen once your payment has been successfully processed and you can then print a copy. This printed receipt will be your ticket to bring on the night.